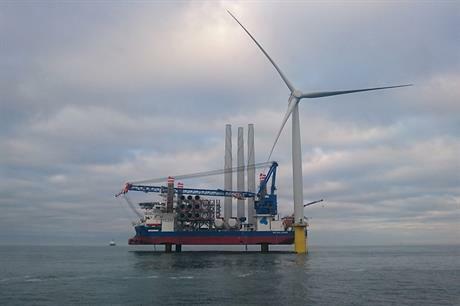 The first turbine was installed by A2Sea's Sea Challenger jack-up vessel. It is the first offshore wind project to use Siemens' Green Port Hull facility as a base port for assembly and load-out. A2Sea's vessel had been in use as an accommodation platform at the project during installation and commissioning of the site's substation, the Danish firm said. A total of 67 turbines will be installed, and the project is set for completion by the end of this year. Dudgeon was one of five offshore wind projects to receive final investment decision-enabling contract for difference support from the UK government in April 2014.